Brethren, Webster’s 1828 Dictionary defines the English word dove as; “a word of endearment, or an emblem of innocence” giving Song of Solomon 2:14 as a reference; “O my dove, that art in the clefts of the rock, in the secret places of the stairs, let me see thy countenance, let me hear thy voice; for sweet is thy voice, and thy countenance is comely.” Most Bible enthusiasts know these verses so this should prove to be the shortest but most ‘poetical’ sermon released by Covenant People's Ministry to date. Today, I intend to examine the significance of doves in our Holy Bible and show why when Jesus was baptized “he saw the Spirit of God descending like a dove, and lighting upon him (Matthew 3:16).” Webster’s Dictionary continues to define the Biblical dove as simply a “domestic pigeon” of a “deep bluish ash color” but the purity of a white dove is undeniable and Yahweh considers them all sacred. In the most recent CPM: Freestyle broadcast I mentioned that God loves birds so much that He added additional Laws pertaining to their care and even king David once said; “Oh that I had wings like a dove! for then would I fly away, and be at rest (Psalm 55:6).” I can definitely relate. Having grown up in Los Angeles, California practically across from the San Fernando Mission there are two distinct sounds that I remember from childhood – the echo of a real church bell ringing late into the night over the sounds of city traffic and the gentle call of the numerous doves who would line the ancient monastery walls or phone lines surrounding it. Even today I find the light “cooing” of a pigeon to be both beautiful and haunting and the same time, much like the true God of the Holy Bible. Let's begin, the first dove mentioned in scripture is the one Noah releases into the sky after the flood upon the ungodly Nephalim. After he looses a disloyal raven that never returns, Noah then “sent forth a dove from him, to see if the waters were abated from off the face of the ground (Genesis 8:8).” We’ve covered this aspect already in Noah’s Flood: Flesh or Beast? so today we should just notice that there was a form of partnership or deep bond between Noah and the flawless dove. In this chronicle we can find the closest Biblical account of someone ‘accepting Christ’ as the dove is representative of the Messiah and Noah draws her into the ark. While ‘the hateful bird’ circles the ark above, the loyal dove repeatedly returns to Noah until the proper time appointed and is actually guiding his family through the blackness of the storm. Matthew Henry's Commentary says this; “The dove is an emblem of a gracious soul, which finding no rest for its foot, no solid peace or satisfaction in this world, this deluged defiling world, returns to Christ as to its ark, as to its Noah. The carnal heart, like the raven, takes up with the world, and feeds on the carrions it finds there.” How accurate are those words! Jesus will only carry us a part of the Way and after that it's up to us to keep going, this is why faith is so important. It is faith that brings forth Godly sorrow leading to genuine repentance. Here's a perfect example - in Sodomites: Haters of God I proved that Abraham was ‘chosen’ over Lot because of his genuine heart and complete faithfulness, but what I didn't point out then was while Lot was being taken captive righteous Abram was making a continual offering to Yahweh and among the sacrificed a turtledove was offered (Genesis 15:9)." Unlike Sodom, the dove represents purity just like the Messiah Himself. Nazarites were a chosen seedline above all others and in order to become (or remain) pure in the eyes of Yahweh it required the direct sacrifice of a dove. Lamentations 4:7 further teaches this about them; “Nazarites were purer than snow, they were whiter than milk, they were more ruddy in body than rubies, their polishing was of sapphire.” That's certainly a vivid and perfect description of racial purity - white and ruddy. Still, there was none more pure than Christ. Now, knowing that the dove represents purity - consider the first account; “Jesus, when he was baptized, went up straightway out of the water: and, lo, the heavens were opened unto him, and he saw the Spirit of God descending like a dove, and lighting upon him (Matthew 3:16).” Nobody but an antichrist would dare suggest that our perfect sacrifice for sin wasn't untainted and that's exactly what's being established in these accounts, both spiritually and physically. Like Peter promises in Acts 2:38, baptism and repentance bring about the gift of the Holy Spirit and our perfect example Jesus Christ did likewise. In the Old Testament ordinances a dove sacrifice was also used for trespass offerings (Leviticus 5:7-10, 12:8), burnt offerings (Leviticus 1:14-17) and is used heavily in purification of lepers (Leviticus 14:22) or women (Leviticus 12:6-8, Luke 2:24). The symbolic significance of this dove is a form of ‘cleansing’ for the sacrifice and alter, both of which are now Jesus Christ. This is the second rendering; “Straightway coming up out of the water, he saw the heavens opened, and the Spirit like a dove descending upon him (Mark 1:10).” This “spirit like a dove” is also representative of the purification of our own personal baptisms where we wash away all our old sins in the powerful ‘blood’ of the Messiah. Many false brethren like to explain away the importance of crucial baptism even though our own Savior was obviously immersed to begin His own ministry and the Holy Spirit isn’t obtainable without such an act. 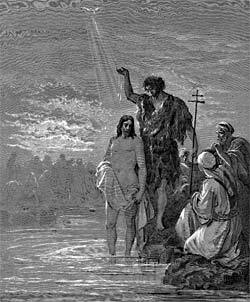 It was directly after His baptism that Jesus was “led up of the Spirit into the wilderness to be tempted of the devil (Matthew 4:1)” so be sure to be baptized before attempting spiritual battle. Still, the next Gospel proves that with Christ it was a physical dove because Luke explains it this way; “The Holy Ghost descended in a bodily shape like a dove upon him, and a voice came from heaven, which said, Thou art my beloved Son; in thee I am well pleased (Luke 3:22).” During baptism, the Holy Spirit falls “in a bodily shape (like a dove)” upon Jesus while Yahweh exclaims “Thou art my beloved Son; in thee I am well pleased” so at this point Christ becomes an acceptable sacrifice to the Father much like in the Old Testament rituals. Finally, the fourth Gospel says; “John bare record, saying, I saw the Spirit descending from heaven like a dove, and it abode upon him (John 1:32).” Purity and separation are very essential, in fact it's the very meaning of the word holy so when we read these passages in a topical sense, we should be able to see that Jesus Christ is both our dove and protector being God in the flesh. How many churches in America today preach about Jesus Christ fashioning a “cat o’ nine tails?” Most of the current 501(c)3 Babylonian whorehouses out there instead “with feigned words make merchandise of you (II Peter 2:3)” teaching unbiblical tripe. Consider this - these types of whips usually contained small pieces of sharp glass or stone embedded into the tips and with ‘one in hand’ Jesus goes about beating the jews from the temple while trashing their lucrative money-tables (Matthew 21:12, Mark 11:15). This event took place during the Passover or what would be celebrated in pagan circles today as “Easter” and this type of ‘selling of indulgences’ was protested by Jesus because He never tolerated evil. Jesus came against the universal church. When speaking about spiritual warfare Jesus commands us thus; “Behold, I send you forth as sheep in the midst of wolves: be ye therefore wise as serpents, and harmless as doves (Matthew 10:16).” This command is seemingly the opposite of what transpired between Him and the wicked moneychangers who were already forming an early type of easy-believism by selling the very sacrifices that should be brought forth by the humble sinners themselves. For a moment, consider Abel and Cain or Jacob and Esau within this regard, which ‘offering’ was accepted most by Yahweh? We must always be careful to avoid the ‘broad way (Matthew 7:14)’ and do as Yahweh requests. So many in life look for an ‘easy fix’ because they have placed God on the ‘back burner’ of life. Many of these poor souls can be found in the pagan-melded Catholick churches who forgive sins for a price or instead play the role of God as a ‘pope’ (which means “Father” in Latin, read Matthew 23:9). We must bring forth our own fruits of repentance and they must be sincere, anything less is abomination in the eyes of Yahweh - let's never fall into the trap of globalism. My intention with this morning's study is to show the correlation between Jesus Christ and the dove and prove that our God and Savior is all things to all people, surprisingly many Christians lose sight of this. Micah 4:5 says; "For all people will walk every one in the name of his god, and we will walk in the name of Yahweh our God for ever and ever." Reading the Bible and trusting in it are two entirely different things and so few these days do the latter. War for Christ! Amen.